Suzuka: Nico Rosberg romped to victory at the Japanese Grand Prix on Sunday, piling more pressure on Lewis Hamilton as the German closes in on a first Formula One world title. 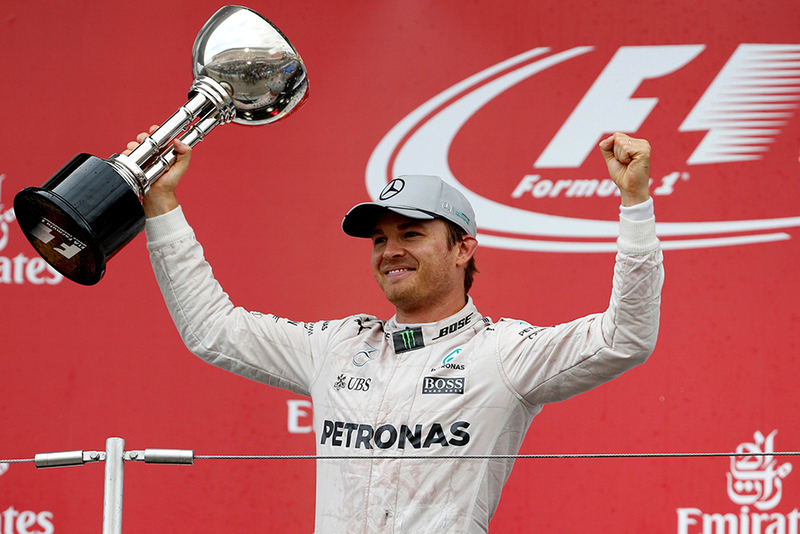 Rosberg claimed his first Suzuka win from pole as Hamilton took third after a horror start. He stretched his lead over his Mercedes rival to 33 points with just four races left this season. “Woooooooh!” cried Rosberg over team radio after his ninth victory of 2016 and his fourth in the last five races. “Thanks a lot, guys. An amazing weekend and congrats on winning the constructors (championship),” he added after he and Hamilton wrapped up a third successive team title for Mercedes. Red Bull’s Max Verstappen held off a furious challenge from world champion Hamilton in the final few laps to take second place, five seconds back, after his runner-up finish in Malaysia last weekend. The Ferraris of Sebastian Vettel and Kimi Raikkonen came home fourth and fifth after both drivers turned the air blue over the radio, complaining about backmarkers. Red Bull’s Daniel Ricciardo, who inherited victory in Sepang after Hamilton’s engine caught fire, took sixth ahead of the Force Indias of Sergio Perez and Nico Hulkenberg. Williams drivers Felipe Massa and Valtteri Bottas finished ninth and 10th on a one-stop strategy. Hamilton, who has now failed to win since Hockenheim at the end of July, almost fought back to take second as the Briton tried to duck around Verstappen coming into the chicane on the last lap. But the Dutch teenager blocked off the inside, forcing the Mercedes to lock up and slip onto an escape road. Mercedes later lodged a formal protest against Verstappen only to withdraw it less than two hours after the race. Both teams agreed but Mercedes, who claimed their third successive constructors’ championship at Suzuka, did a U-turn after Hamilton told his team: “It is not what we do”. Rosberg, whose Finnish father Keke won the 1982 Formula One title, failed to convert pole position into victory in Japan the past two years, both times losing out to Hamilton. “No stress, Lewis,” came the reply before Hamilton began a rousing charge through the field to try and make up places. Rosberg’s progress was untroubled, however, twisting the knife with a masterful drive as Hamilton’s miserable run continued. “I got everything right,” said Rosberg, who has been quickest all weekend in Japan. Hamilton, who controversially hinted at sabotage from within the Mercedes team after his third engine failure of the year last week, cut a forlorn figure on the podium, the 100th of his career. “I did the best I could with where I was in the race,” he said glumly.